The two malignant outcomes of the politics of divide and rule – economic and social divisions – were mutually reinforcing in that they were bound together in a downward spiral. The government fragmented the society into many segments and that led to general impoverishment; which increased the economic inequality between segments which then led to greater strife, and so on. But all that changed in 2014 when Indians finally gained economic and personal freedom. It was a freedom movement and it finally gave meaning to political freedom, the freedom they had nominally had since 1947 but had never been empowered to enjoy. Today we can celebrate 2014 as the year of India’s Real Freedom. Let’s briefly review what happened and why. Change is not generally welcomed by people. We like to maintain the status quo for as long as we can. But when things become totally unbearable, even the most lethargic people take action. Revolutions happen when the old ways of living become absolutely intolerable. For India, change had been a long time coming but it was not until the people were staring down at the abyss from the edge of the precipice that things finally changed for the better. If you review the situation around 2010, you will probably react with shocked disbelief. Consider the level of corruption. Every other day, yet another “scam” involving billions of dollars would come to light. It was not just your everyday petty corruption such as bribing a local official to overlook some minor matter. That petty thievery was so pervasive that it did not evoke any comment or surprise. It was as much a fact of life as air or water. The mega-scams we are talking about were quite different. That was corruption of astronomical proportions that is hard for people to fully comprehend. They involved politicians, naturally. But politicians cannot act alone. They were joined in the looting of public resources by industrialists, by newspaper and TV journalists, by judges, by bureaucrats, and even celebrities. These scams involved such diverse areas as animal feed, government tenders, grains such as rice and wheat, public distribution systems, radio spectrum, defense contracts, mining rights, real estate deals, major purchases of equipment from abroad, you name it. There was no segment of the economy that was untouched by massive corruption that involved people at the highest levels. You may ask if there was a common thread that ran through all these cases of high corruption. Yes, indeed, there was. Regardless of which sector of the economy that a particular scam was in, the government was always involved. If you think about it for a moment, this makes absolute sense: because the government was involved in practically every sector of the economy. You probably have heard of the “license - control - permit - quota” raj. Let me remind you what that was all about. The Indian government was inextricably involved in the Indian economy. It controlled all aspects of the economy. It was into the production of such diverse goods and services as electronics, railways, telecommunications, radio and TV broadcasting, aviation, mining, heavy machinery, petroleum refining and retailing, education, housing, medical care — it was an unending list. You could not avoid the government meddling in anything you did. Before you could do anything, you had to get permission from some government official, often half a dozen of them. The government told you who you could hire, what you could pay them, if you could fire them and the rest of it. In some cases, the government even forced private sector companies to hire people based on their caste and religion. It was an odious and pernicious government. Just to give you an example that you would appreciate, let’s consider education. The government decided who was allowed to run educational institutions, what was to be the capacity, what was to be taught, who could be employed to teach and how much they were to be paid, how many students of particular segments of the population could attend, how much tuition fees could be charged, what was going to be in the examination, when the examinations would be held, what was considered appropriate passing grade for whom. The outcome was a severe shortage of quality educational institutions. Remember that in a free system, shortages do not persist. For persistent shortage of anything, you have to engineer the system. The shortage of educational opportunities was engineered because that allowed the government officials – the politicians and bureaucrats – to extract profits, and for handing out favors to specific groups in exchange for their support. The government made getting an education a privilege that only it had the power to grant. Kids like yourself had to needlessly spend years during their high school years just preparing for entrance exams, which as we noted before did nothing but select a very small percentage from the applicants and reject even quite well-qualified and able students. Government control of and interference in education was the reason that the supply was low, and resulted in poor quality education and unaffordably high costs. The same story can be repeated in every area where the government interfered. Fortunately for you and a hundred million others like you, the government was forced to relinquish its control on education. How did all that change? With economic freedom, entrepreneurs entered the education sector and radically transformed education. From an “education deficit” state, India became an education surplus state. In the past, Indians students used to go abroad for higher education and very few foreign students came to India. Today while India still “exports” students, the “import” of students is in the tens of millions. India is a destination for higher education and the Indian economy gains hundreds of billions of dollars providing educational services for the world. Let’s take another example of what happens with governmental withdrawal from being in business that it has no reason to be in in the first place. Consider the railways which we mentioned a short while ago. Trains were overcrowded, the speeds were pathetic relative to the rest of the world, fatal accidents involving hundreds of lives every year were routine. That’s not what we have now. Our trains now are safe, clean, affordable, and fast. In 2020, the railways gained freedom from the government. You may ask, did the government let go of any sector of the economy before 2010 and what was the result of that “liberalization.” Yes, indeed. I will mention two areas. First was civil aviation. The government had a monopoly on commercial air travel until around 1990. Its two public sector airlines — Indian Airlines for domestic travel and Air India for international travel — were mismanaged, lost billions of dollars of tax payer money, service was shoddy and supply was limited to the extent that you had to sometimes get a recommendation from a high ranking politician or bureaucrat to get a ticket. With liberalization of the aviation sector, private airlines took to the air. Some of them became known around the world for service quality, safety and comfort. Some of them are still around. The competition in the market even forced the public sector airlines to improve. The public sector Air India (created in 2008 by merging the international and domestic public sector airlines of India into one) continued to lose billions of dollars every year. What that meant was that the poor of India who never ever flew Air India were paying for its mismanagement. Fortunately, it was finally privatized in 2015 and it turned profitable soon after. The other important example of sectoral liberalization prior to 2010 is the telecommunications sector. I don’t have to tell you how important mobile internet is to you today. Your mobile phones and always available internet access is a utility that you use nearly all your waking moments for education, entertainment, social interactions and so on. But it was not this way before the 1990s. The government had a monopoly on telephone services. Waiting time for getting phone service was — wait for this — around 10 years. Some people applied for a telephone when a child was born, hoping that they will get a connection by the time the child became an adult. The telecom sector was liberalized in the mid 1990s and in a few short years India was adding 10 million telephone subscribers per month. Today everyone has a mobile internet connection. To appreciate how dramatic that change was you have to know that the government telecom company had installed only 20 million telephone lines in the entire period before 1947 and 1990. It used to be that the rates for phone calls in India were one of the highest in the world. By 2010, rates were the lowest in the world. The explanation for this reversal lies in market competition by the private sector telecom companies. This underlines one of the fundamental truths of economics: markets work. The change in the Indian broadband access market appeared much later than in the telephony market. What used to be unaffordable high prices for internet access, dropped by orders of magnitude in 2015, and so the average citizen was finally able to get online. That increased efficiency in all sectors of the economy. As you know, since 2014 the government has liberalized the economy fully. The government is no longer in the business of business. The private sector is the appropriate agency for business. Freedom, as I mentioned before, is critically important. Economic freedom was one missing critical bit and once that was attained, the Indian economy took off. You must remember this: The prosperity that you enjoy in 2040 — the prosperity that was denied to your forebears for generations by the government — is to a very large extent a result of freedom from government. To be more precise, the government’s withdrawal from interfering in the economy provided the space for the entrepreneurial talent of Indians to create the country that you live in today. Freedom from oppression is a deep drive in all humans, and Indians denied freedom for so long were especially charged to make immense leaps when they tasted complete liberty for the first time in modern history. The question naturally in your minds then is what is the role of the government. The answer is: look around you and you will see that the role of the government is to provide the things that it provides today. You see that the government provides a number of very critical things, and it does so efficiently and effectively. It is into law enactment and law enforcement through its courts and its legislatures. It is into providing external security through the armed forces. It runs a central bank whose function is to regulate money supply, regulate banking and other financial institutions, and control inflation. In other words, today the government acts as a referee, not as a player. It provides a level playing field for all, a platform for the big games of society. It does not, as it previously did, get into the game itself and make all the rules for it to win at the expense of us all. What we before is summed up in the old Hindi saying, “jab raja vyapari, toh praja bhikari” — which loosely translated means that the citizens are reduced to begging when the government gets into business. Today we all know that the big problem we had was that the government meddled in all aspects of our lives, public and private. It was a jack of all trades and naturally it could not be master of any. Because it was into areas where it had no competitive or comparative advantage in, it was unable to provide those core functions that are so necessary for a country to function. Let me illustrate the importance of the government actually doing its job. You know that as a citizen of India of 2040 you can approach the courts to settle any dispute. You know that if you do that, your case will be heard within a couple of months at the most and the judgment will be delivered shortly thereafter. You would fall off your chairs to learn that previously the courts were so overloaded with cases that it often took decades for matters to be heard. Case backlog ran into millions and it was said that even if no new cases were filed, it would take 300 years before all cases were heard. That one single fact — that India effectively did not have a functioning legal system — itself held back India’s economy for decades. You have to appreciate that in any complex large economy, the courts are part of the invisible but vital infrastructure that support every conceivable interaction between individuals, corporations and the government. When courts don’t function, or don’t function efficiently, the economy stagnates. The lesson for us is clear. If the government gets into areas that it has no competency in, it necessarily becomes incompetent even in those areas that it must be competent. If the government gets into the business of running hotels and airports — which as history tells us that it did and did very ineptly — then it should come as no surprise that it could not run the courts efficiently since it was stretched too thin. All this surely raises an interesting puzzle. Were people so ill informed or stupid that they did not realize for decades what the proper role of the government must be? What prevented them from getting themselves a government that actually did work for the benefit of the people, instead of a government which appears to have actively been antagonistic towards its people? That puzzle becomes immediately clear when you consider that India had a colonial government which ruled India till 1947 and understand what happened after that. History matters in the affairs of all — individuals and governments included. India’s colonial history explains why the post-colonial government of India did so much to sabotage India’s emergence as a developed nation. The outlines of the story are simple, as we will see next. The British, who had come as traders to India, were able to dominate India and turn it into their most valuable colony. India was the “Jewel in the Crown” and in 1857, the queen of England was the Empress of India. India was ruled by a foreign government and naturally the objective of that government was to enrich itself. This is totally understandable since colonial governments are not in the business for altruistic reasons; they are there for their own benefit, which they do by exploiting the economy and extracting from it whatever wealth possible. If you wish to extract and exploit something, the first thing you must do is to control it. The entire enterprise that the British government undertook in India was therefore geared towards controlling every aspect of India. Indians had to get permission for everything from government officials. The rules were made to keep the citizens in their place. All the power was vested in the rulers. The laws and regulations were bad for the people but good for the government. Once again, what else would you expect from a colonial power? Following the end of the Second World War in 1945, the British Empire was running out of steam. The war had extracted its toll. On top of that, colonialism was going out of fashion. India had been mined for wealth for over a century and it was getting harder to extract much wealth out of India. The cost-benefit analysis of extraction just did not add up. Besides, the Indians had been pleading for independence and it was time for the British to go anyway. So they handed over the keys to the building and they left. Just like that. The changes were cosmetic. The names on the doors changed, not what was within the building. The names of institutions changed – such as from “Indian Civil Services” to “Indian Administrative Services” – but the objectives of those institutions remained the same. The objectives of the government remained the same: to control the economy so as to best extract and exploit it. That is the genesis of the “license - permit - quota - control” raj we referred to earlier. In 1947 began “British Raj 2.0”, as the rules remained the same as before with only minor changes. It was good to be rulers when the rules were all in favor of the rulers. That is why the people who took over after the departure of the British found the system not worth changing. They were in power and they controlled the economy for their benefit. To be sure, there was frequent talk about how the government was doing all it could to eradicate poverty and was for economic development. But for all intents and purposes, the government was no different from the British government in its baleful effects on the country. From 1947 onwards to the start of the last century, India struggled on. Deepening poverty was the overall theme, even though there were little successful sideshows such as briefly becoming the back-office for the world around the turn of the present century. That was mainly due to labor arbitrage which soon enough ended with technological progress. Let’s talk for a moment about objectives and why they matter. If your objective is to become proficient in swimming, you do certain things that are consistent with that objective. Your “policy” is then to keep aerobically fit, engage a swimming coach, study the most effective methods known for increasing your efficiency in water, etc., and do outdoorsy things. If instead you want to become a physicist, your policies are entirely different. You take college courses in physics and spend hours in learning stuff on the internet, get yourself a tutor or a guide for physics. You don’t spend much time swimming at all. The outcome of your policies which were dictated by your objective is predictably different. Objectives lead to policies, which then in turn dictate the outcome. In other words, the outcome is a function of the objective. Now here’s the important bit. One can infer what the objective must have been from observing the policies and the outcome. I don’t need to hear you declare whether your objective is to be a swimmer or a physicist. All I have to do is to note whether you spend more time studying or swimming, and whether you get medals for swimming or for physics papers. If I see you develop a slim swimmers body, I can reasonably deduce that your objective must have been to become a swimmer. We care about development and expect the government to take such steps that result in welfare improvement. Therefore, regardless of what the stated goal of the government is, by observing the outcome we can deduce what the objective of the government must be. To answer the question, “Is the government the type that enriches itself at the expense of the economy?” we have to observe what the outcome is. If the people in government are getting richer and the citizens are not, then it is entirely possible that the government’s objective is to extract and exploit the citizens. Was that the case prior to 2014? Let’s look at the evidence. India’s per capita annual GDP — which is another way of stating the average annual income of citizens — was $1,200 in 2010. Relative to the developed countries, this was exceedingly low. Compare that to the United States which had a per capita annual GDP of $48,000. India not only started out with a very low per capita income, but instead of catching up with the developed countries or even keeping pace with other developing countries, it actually fell behind. India could have developed like the other Asian economies did. Take South Korea, for example. In 1950, India and South Korea had nearly the same income per capita. As a percentage of the US per capita income, India was at 7.1 and South Korea was a slightly better 7.6. By 1980, India had shrunk to 6.5 while South Korea had moved up to 24.8. The gap continued to widen. By 1995, South Korea had speeded up to 42.4 while India slowed down to 5.2. South Korea’s story of development indicates that development is possible if the right economic policies are followed. 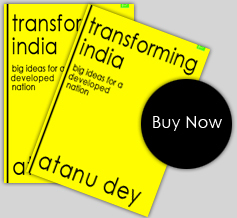 India’s story illustrates that development is not inevitable. India lost more than 70 years of economic growth due to bad policies that its leaders imposed on it. Indians continued to live in poverty. India’s leaders – the ones who were responsible for the poor policies that impoverished the nation – prospered beyond belief. By 2010, it was estimated that $1,500 billion was salted away in off-shore banks by politicians and businessmen. The leaders became rich while the country did not. What that demonstrates is that the objective of the Indian government was not development at all. Most of the politicians — with only a few notable exceptions — were corrupt to the core. Indeed, being in the government was the most exalted position one could be in. It allowed you almost unrestricted power. The government was so powerful that success in business frequently depended on how close you were to that powerful government. There was a nexus between the government and business. Government was in business, of course. Powerful business leaders were powerful precisely because of their proximity to the government. This was understandably so because the government had the power to control the fortunes of businesses. It was also a two-way street: businesses supported the politicians and politicians supported business leaders as a quid pro quo. There was a sea change in the relationship between the government and the private sector. That relationship started changing around 2015 and was nearly complete by 2025. What changed was that the government stopped meddling in business and business stopped meddling in government. Remember the reason that business meddled in government was because there was no alternative. Industries that depended on government support had to make sure that they got such people in government that would give them support. With full economic liberalization, business prospered not because of government patronization but because of the value they created for society. Business profits became a measure of how much wealth they created for society. Relieved of having to expend effort to get the government’s support, businesses got down to business. That was their comparative advantage and thus they were able to create the wealth we enjoy. Every entity has a comparative advantage in something, and doing what we are comparatively good at is the secret of success. India’s success is the result of substantive changes. The change begins at the top: India’s success today is the result of a change in the objective of the government. From an exploitative and extractive government, we changed to a development oriented government. From that change in objective followed a different set of policies. These policies changed the way that the economy worked. We must explicitly note an important point here. When we use the word “government” we must remember that it is really a collection of people just like you and me. What distinguishes them from us is that they have a specific job, which is formulating and executing public policy. If you get a different set of people in government, they will have a different set of objectives. From those will flow different policies which will lead to different outcomes. Therefore, the outcome changed for India — it became a developed country from an impoverished country — because a different set of people were elected to become the government. How this change happened is part of our story. It is a story of a small group of people, which is always the case for all change. That small group of people understood that collective action was needed. They started a public education campaign to make the people aware of what was wrong with the country and why. That led to political action by the educated middle class urban voters. That brought about a different of set of political leaders to the front. These new political leaders understood the basic principles — termed “Pretty Good Principles.” These were principles which redress the balance of power between the government and the people, reduce the size of the government, prohibit the government from running businesses, restrict the government to its core functions, and give comprehensive freedom to people. The Constitution of India had been amended in 1976 to add the word “socialist” to declare that India was a “socialist, secular, democratic republic.” Forty years later, in 2016, after immense suffering brought about by socialism, socialism was finally discarded and “socialist” removed from the Constitution. The government was no longer wedded to socialism. That change is the root change and every other change is derivative from it. Policy changes followed from the change in the government objective. Policy changes severed the unholy nexus between the government and business. Business focused on creating wealth for society, and the government focused on providing good governance. Policy changes gave people economic and personal freedom. Freed of government control, the natural entrepreneurial nature of people brought forth changes that resulted in our peaceful and prosperous society of today. What used to be seen as problems before disappeared without a trace. Fact is that they were not really problems but were actually symptoms of the deeper malaise of government control. Corruption is an example. Corruption is a symptom, not the problem. The underlying problem is control. Remove the power to control, and you automatically remove the power to extract wealth through corruption. Remove the benefits of power and you remove the incentive for the corrupt to seek power. Thus another problem which was actually a symptom was labeled the “criminalization of politics.” Criminals entered politics because politics afforded them the opportunity to amass wealth. The opportunity to amass wealth is directly related to how much control the government has over the economy. When the rules changed and the government no longer had control over businesses, the ability of politicians in power to make money disappeared and with it the incentive for money-grubbing criminals to enter into politics.